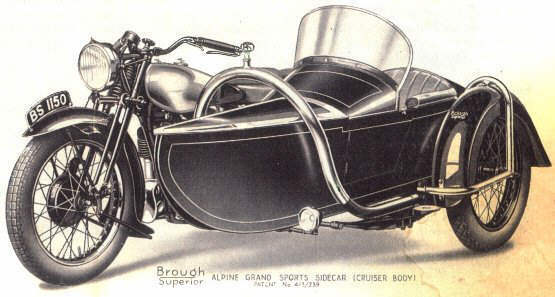 This entirely new Brough Superior Sidecar is manufactured in my own factories. This masterpiece is patented throughout the world, and has been supplied in large numbers since its introduction two years ago, with every satisfaction to owners. Excellent results prove that my experience and decision is marketing this chassis, the main member of which consists of one large diameter endless tube, is fully justified. There are no brazed joints to cause crystallisation and consequent breakages. The body is underslung and carried on two long, flat, car-type leaf springs ; the quickly detachable wheel is properly housed in a tubular cradle frame ; as is also the car-type mudguard. The Single Frame Tube is utilised as a spare petrol container - it holds 1 1/2 gallons - very useful on a long night journey.